FILE - A group of people are detained by Border Patrol agents on horseback after crossing the border illegally from Tijuana, Mexico, near prototypes for a border wall, right, being constructed in San Diego, Calif., Oct. 19, 2017. The U.S. president is denying any rift with his chief of staff after John Kelly said Donald Trump's views had "evolved" since taking office a year ago. The comment reportedly angered the president. Trump, speaking to reporters in Pennsylvania on Thursday, said, "I think General Kelly is doing a really great job. He is a very special guy." Asked whether he minded Kelly telling members of Congress that Trump was not fully informed about immigration, the president replied, "No, he did not say that. He didn't say it the way you would like him to say it." 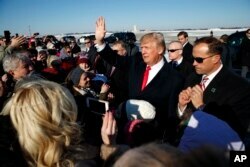 President Donald Trump waves to supporters after arriving at Pittsburgh International Airport, Jan. 18, 2018, in Pittsburgh. On the way to Pennsylvania on Air Force One, White House spokesman Raj Shah told reporters that Kelly, who was a Marine Corps general in charge of the U.S. Southern Command and later was secretary of the Department of Homeland Security, "understands this issue very acutely," including "the need to build the wall and dealing with Congress, so he will be continuing to talk about the president's views on a range of issues, including immigration policy." Trump earlier in the day asserted that his plan for a controversial wall along the U.S.-Mexico border had "never changed or evolved from the first day I conceived of it." Kelly had suggested that Trump wasn't "fully informed" when he promised to build it. Trump, on Twitter Thursday, said parts of the wall "will be, of necessity, see through and it was never intended to be built in areas where there is natural protection such as mountains, wastelands or tough rivers or water." The U.S. leader offered his comments on building the wall, perhaps his most popular promise during his successful 2016 presidential campaign, as the White House and Congress faced a Friday midnight deadline to extend funding to keep the government running. Money for the wall and protection against deportation of 800,000 young immigrants who years ago were illegally brought into the United States by their parents were part of the contentious Washington debate over new spending legislation to avert a partial shutdown of government operations. Trump tweeted, "A government shutdown will be devastating to our military...something the Dems care very little about!" He contended that the wall "will be paid for, directly or indirectly, or through longer term reimbursement, by Mexico," which has in the past said it would not pay for any border wall. Trump linked the wall to Mexico's $71 billion trade surplus with the U.S., although trade is between businesses, not directly governments. He said the cost of the $20 billion wall was "peanuts" compared with what Mexico makes from the U.S. under the North American Free Trade Agreement, which also includes Canada. The president regards NAFTA as a "bad joke." In his latest comments, Trump contended that without adequate funding for the wall, there could be no deal on immigration policy. ​On Wednesday, Kelly told lawmakers that Trump's campaign promises on immigration were not fully informed and that his thinking on building a wall along the entire border with Mexico had "evolved." 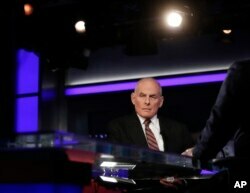 White House chief of staff John Kelly pauses to look to a video monitor as he appears with Bret Baier on Fox News in Washington, Jan. 17, 2018. Kelly said President Donald Trump's views on many issues had evolved since the 2016 campaign. “There's been an evolutionary process that this president has gone through ... and I pointed out to all the members that were in the room that they all say things during the course of campaigns that may or may not be fully informed,” Kelly told Fox News when asked about the meeting with lawmakers. According to an NPR/PBS News Hour/Marist Poll released Thursday, 58 percent of Americans disapprove of how Trump has tackled immigration.